As mentioned on Friday, I'm going to makeover my blog. I starting playing around with the columns and adding a few elements and things but it wasn't enough. I decided what I really wanted was a new colour scheme...this causes some problems for me, as I use my orange/blue signpost in everything! So the fist step is then to find a new one. Keep in mind too, that's a hand drawn sketch. I will try to get fancy with Paint.NET with my finished product. 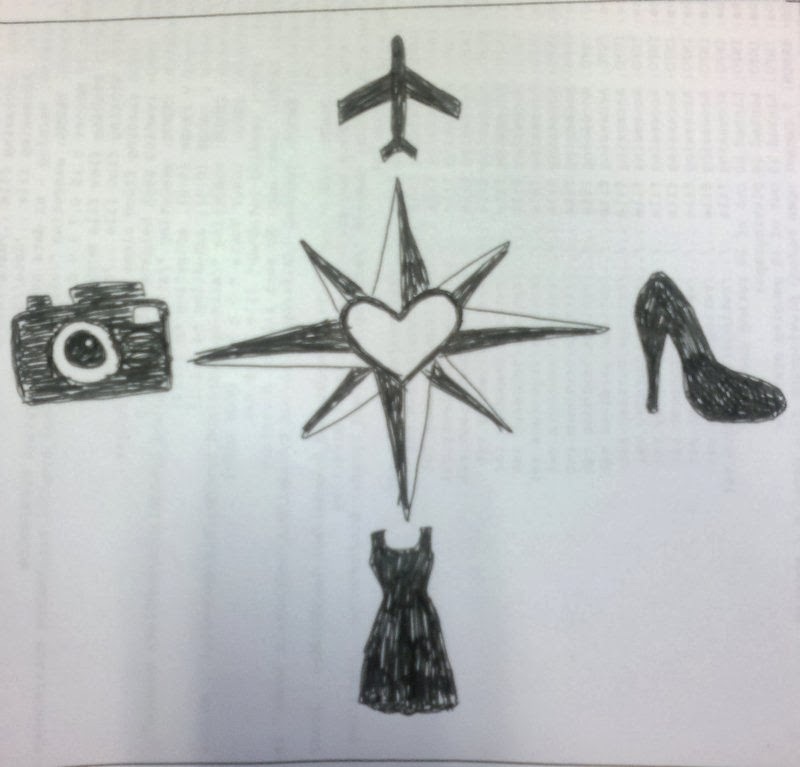 And I 'copied' those images from cliparts I googled, but drew them freehand so I'm not including credits. So, I have a rough idea of what I want my blog to theme around. Now I have to decide on colours. First and foremost, it will include RED. Red is a bit of a signature colour for me, but I would like some advice/help on what to team it with. First up, blue. Blue is also a colour I wear/use a lot. Normally a more royal blue than this one, but I quite like the combination of a paler blue. I see this theme looking a little nautical with stripes incorporated somewhere. The contender is a caramel/golden brown colour. has the potential to be a little more 'sophisitcated' than the blue. Also, weekend update...After getting home from the fireworks, SJ was rather sick (some sort of stomach bug) so we missed the hot air balloons. Bridal Expo went as to be expected, MissA got a good idea of venues and photographers from it which was good. I did all the driving home yesterday (since SJ was still ill) and am rather tired/sore today. I have found a new way to challenge myself exercise wise but will talk about it during Wednesday's 12wbt update. I like the new compass! It is unique. I also think the red and blue is really playful, but yes the other probably looks more sophisticated. Lol thanks. So your opinins match mine and I am stil undecided! My vote is for the caramel! My opinions are the same as you too, but the blue and red makes me feel cheerful which is a positive thing. And the blog the way you are trialling it now looks good. I like caramel too! Can't wait to see what you decide on! So I think that's 3 votes blue, 2 votes caramel? As you can see I have been playing around with the blue of late, I think I will stick to that then until I get sick of it again...stay tuned!